One spring morning, beautiful little Julie decided to take a stroll through the dandelions to see what new things were growing. Being at nearly ground level, she found it exceptionally easy to spot new blossums and sprouts. 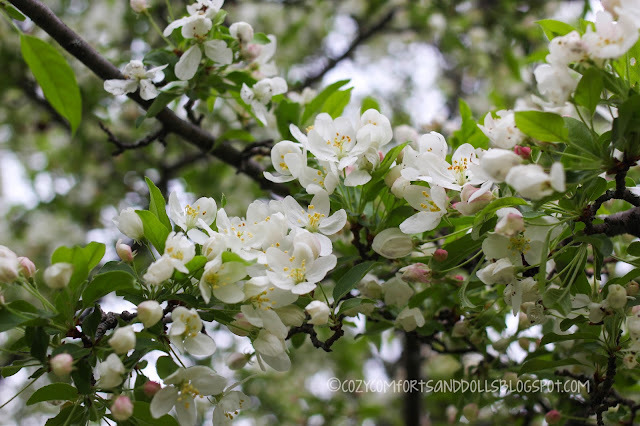 As she meandered along, lost in her thoughts, she felt a sudden inspiration to see if she could climb up the freshly blossomed crabapple tree across the lawn! It took her nearly all morning, but she finally made it across the lawn to the tree. As she sat and caught her breath, she was taken aback by what a different and beautiful world it was up here! The greens, whites and pinks were so vibrant and like nothing she'd seen before on the ground. The fragrance of the flowers was heavenly. Little Julie was glad she took the effort to follow her impulses and climb up that big tree as this was a day she would always remember. Little Julie is a mini American girl Julie Albright doll. These are beautiful photos of mini Julie! The spring blossoms look so elegant! I love the first and third photo the best! So cute! Our crabapple tree is officially dead, not a bloom or bud (or anything!) on it. Now we are trying to figure out what to put in it's place. Cute story! Nothing like having a little fun seeing the world through a doll's eyes. Fabulous capturing of spring here! I love how Julie's shirt works with the colours of the crap apple blossoms - she looks right at home among the blooms! I love these photos! Our blooming trees bloomed at the beginning of April! Now all the roses are blooming. Even the lilac trees are long finished. And I live in Vancouver BC in Canada! We had 90 F heat at the beginning of April. But if we didn't have the weather to talk about, we would be bored. LOL I love little Julie; she is quite an adventurer. Gorgeous photos Farrah, this little Julie is very cute and incredibly adventurous! I love her little teeth too. Lovely photos of Julie, she's certainly an adventurous little lady. :) Love the blossom, makes me feel warmer just looking at it. Thanks, Xanadu! I hope you are enjoying the autumn weather and beautiful colors where you are. Hey Farrah Lily! The HFHG Dolls will be rereleased later this year! The first dolls to be rereleased are Dell, Consuelo, Nahji, and Rahel. Out of these, the only one I do not have yet is Rahel. Regarding the release date for the other dolls, like Tipi or Lilian, they have no information yet. As of now, they don't have an exact relaunch date, I think probably October in time for UN Day. Feeling excited, Farrah Lily?